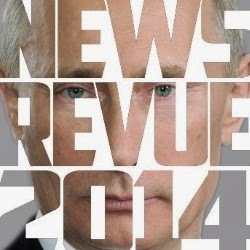 NewsRevue 2014 sees the return of Edinburgh Fringe veterans (and Guinness World Record holders) News Revue with a fresh batch of well-observed sharp political and social satire. This year promised that nobody was safe and that proves to be the case. Everybody from David Cameron to Alex Salmond is presented in scathingly honest and witty skits, each one well directed by Christopher Jeffries. With NewsRevue 2014, there is no time for hanging about – the gag rate is high and fast. The performers are tasked with the task of delivering punch lines such as a neglected party leader longing for the approval of his friend (sending up one of the biggest songs of the past 12 months, and amazingly without changing a single lyric). The experienced cast perform a variety of characters. Mimi Edwards gives a smashing portrayal of Ed Milliband’s attempts to be commanding and popular, and Matt Lee-Steer’s Angela Merkel Michael McIntyre is another of the many well-observed send ups. Alice Marshall’s Cheryl Cole is inflection perfect and Will Mulvey’s side-splitting take on Nick Clegg could do more to restore the Lib Dem leader’s image than anything the real life Nick Clegg has done in the past few years. The cast are accompanied by Michael Riley who, incredibly, keeps a straight poker face despite the hilarity on stage. Perhaps he was once on duty as a guard at Buckingham Palace. One particular sequence evoking the film “Ghost” was brilliant, as was a biting commentary on the phenomenon of the ‘selfie’. The final number lampoons the current Scottish independence debate, and mashes up political heavyweights with one of musical theatre’s best known songs. This isn’t a show for those looking for light amusement but if you like your humour in a Mock The Week/Have I Got News For You vein and fancy seeing those jokes given life, you’d do well to snap up a ticket to NewsRevue 2014 soon before you miss out.